Keep up to date with the latest news and information about Georgia Mountain Cabin Rentals and beautiful Blue Ridge in the media. 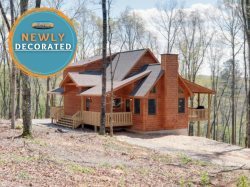 Featured on HGTV's Log Cabin Living Season 6, Episode 12, Mountain River Lodge was the answer to four best friends looking for something different to invest in, a beautiful Blue Ridge log cabin. Now in our inventory, this home is perfect for large groups, family gatherings, and small weddings! The abundance of outdoor adventure and the beautiful natural surroundings you find in the North Georgia town of Blue Ridge make it a perfect destination for a family get-away.